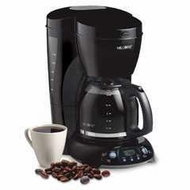 With its removable grinding chamber, this coffee maker lets you choose between fresh, whole coffee beans or ground coffee. The handy Brewing Pause 'n Serve feature lets you pour a cup of coffee while the coffee maker is still brewing. And the Brew Strength Selector means your coffee is always made just the way you like it. Grinding Chamber is dishwasher-safe to allow for easy cleaning.